Is it possible to find a without knowing its name? I created a file with LaTex, then I copied it into another local directory and renamed the pdf. I don't know any more where the original file is located, but I have the renamed file on hand. I would like to make some modification to my latex file and recreate the pdf. Since I know the original file is exactly the same as the renamed one except for the name, is there any way I can find my original file? When the only difference is the name booth files should have the same content and size. Note that, by default the command find works recursively. Once installed, follow the steps below. Select the "Duplicates" option (1) to search files with the same content. Click on the "+ Add" button (2) and select the directories to look for files (make sure the "recurse" option is checked to include sub-directories). Click on the "Find" button (3) and wait. shopt -s globstar turns on recursive globbing with **. You can turn it off with shopt -u globstar, but it is off by default and will be off when you open a new shell. echo $i print the relative path of the file (this also prints the path of file itself, but I didn't see much benefit in fixing that). Thanks to this answer on Stack Overflow for the cmp method of comparing files. If your file might be on a Windows directory remove the mnt directory. Not the answer you're looking for? Browse other questions tagged command-line files text-processing or ask your own question. What are the '~' files created when I edit something and can I delete them? 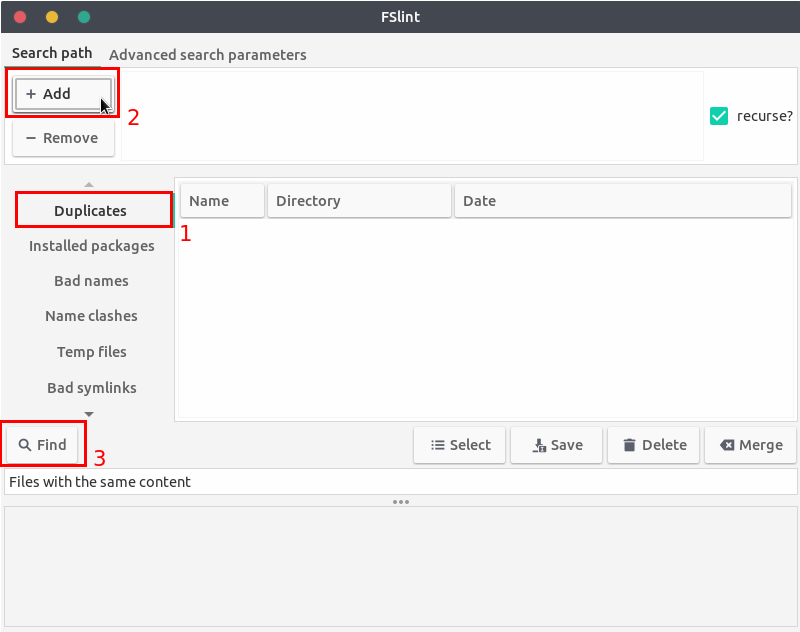 How to find the path of an mounted iso file? Locating a file without knowing its name, only its content? How to copy files from multiple directories, adding the parent folder's name to the filename?